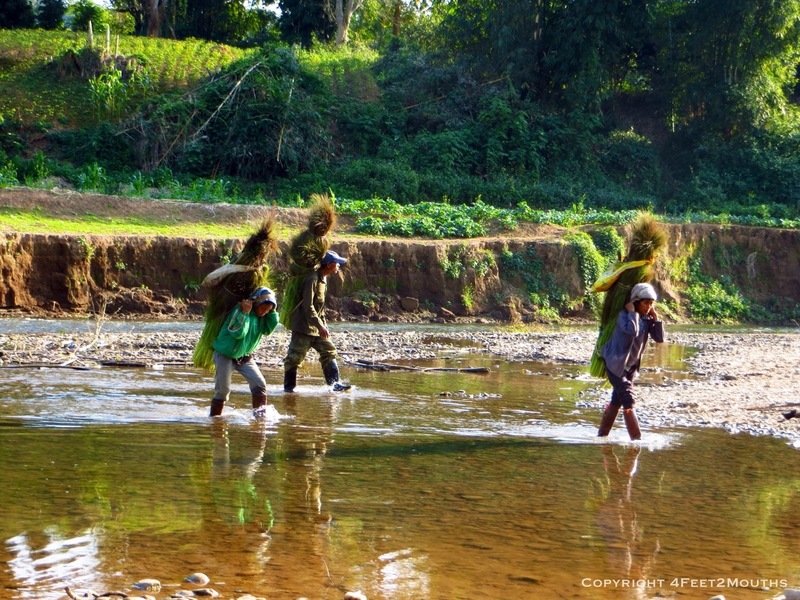 Real Laos is in the jungle, deep within the banana trees and bamboo forests. 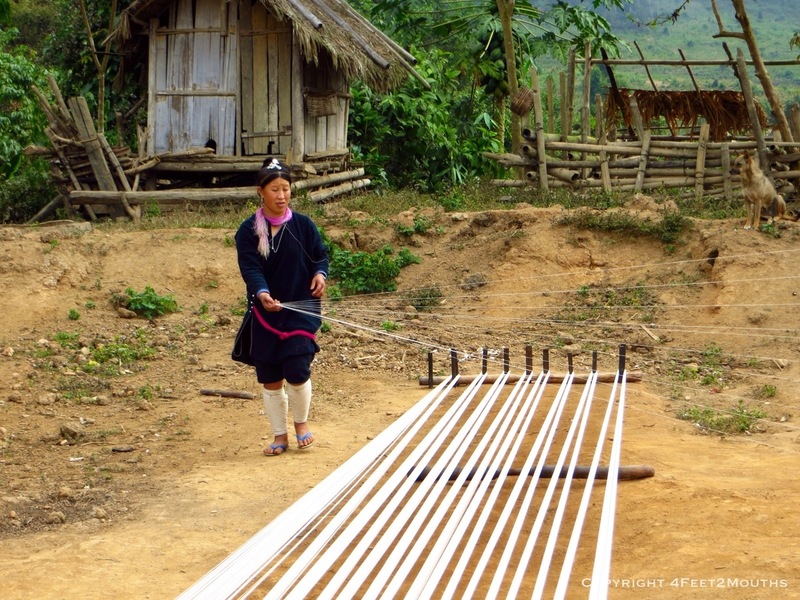 Eighty percent of the population of Laos lives in rural communities. Many people live in tiny sleepy valley towns, but some communities are tucked deep into the mountains. Tiny muddy trails meander through the forests connecting the stilt villages of the mountain. 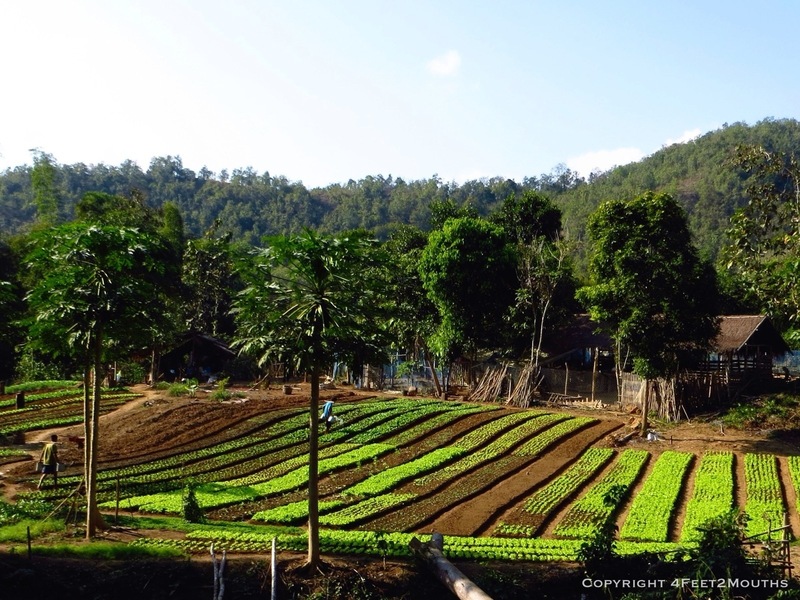 We wanted to visit this more rugged Laos, we wanted to learn more about the bountiful food source of the jungle and learn about traditional Laos people. I was getting a little restless and a hike in the mountains was just what I needed. 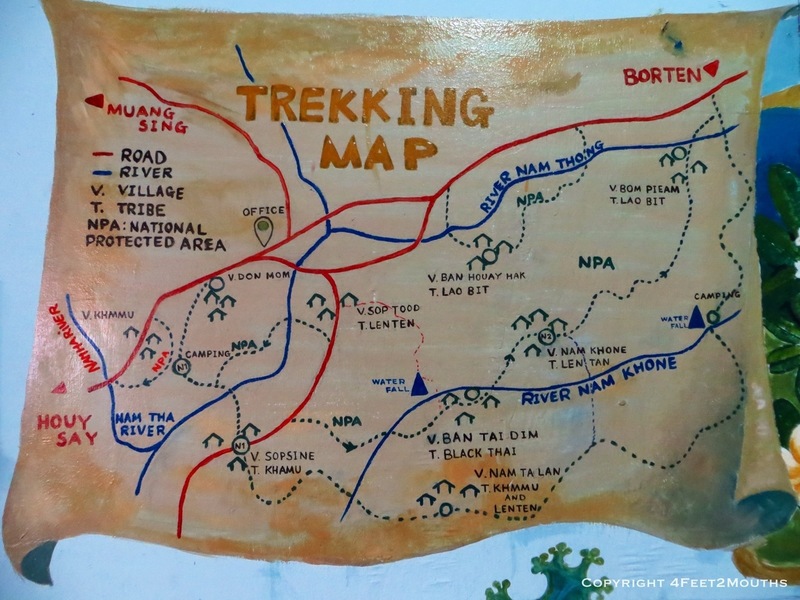 So we packed bare essential packs and loaded into a tuk tuk to bring us to the base of the Nam Ha national protected area. Our first stop was the local market in the city of Luang Namtha. Carmen and I had visited this market a day earlier so we went for our favorites. 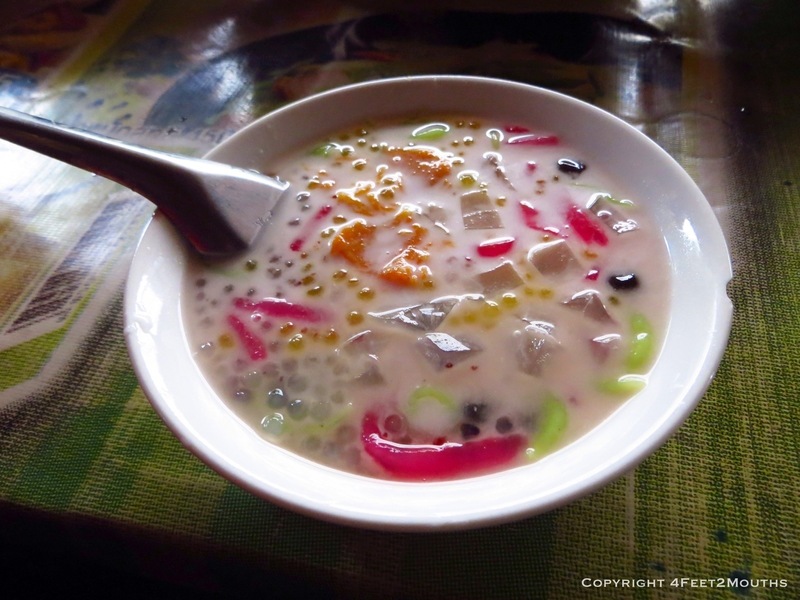 Some sweet soup with a mix of jellies, beans and sweet milk was first on the menu. 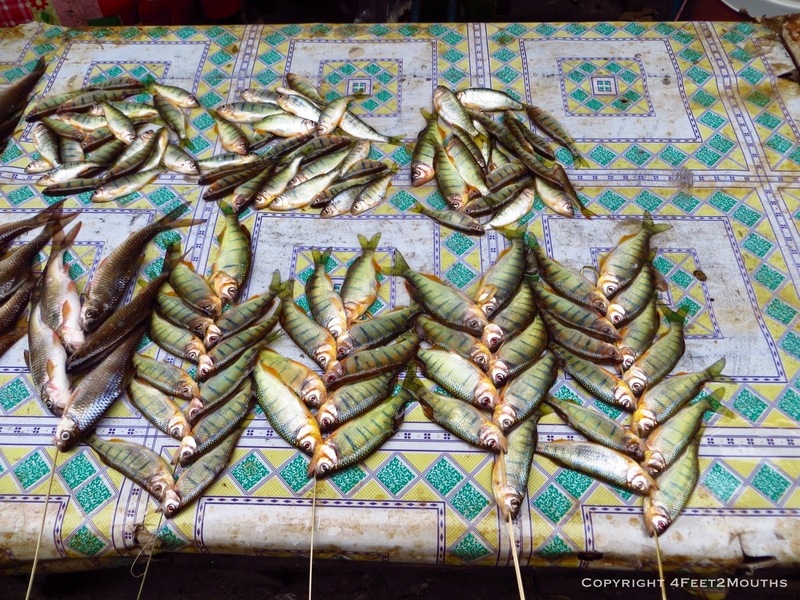 On the other side of the market there were these tiny fish that shined with iridescent greens and blues as we passed as well as the usual chopping blocks stacked with meat, blankets mounded with vegetables and a few caged rodents, chicken and ducks for sale at the perimeter. I had been eyeing some local lao lao, a rice liquor similar to what we had in Vietnam. But this moonshine was more raw and burning, a toxically good late night sipper. It sold in re-used plastic water bottles that often have caps or plastic wrap and a rubber band. I bought one thinking it would be fun to share with the guide and other people in our trekking group. 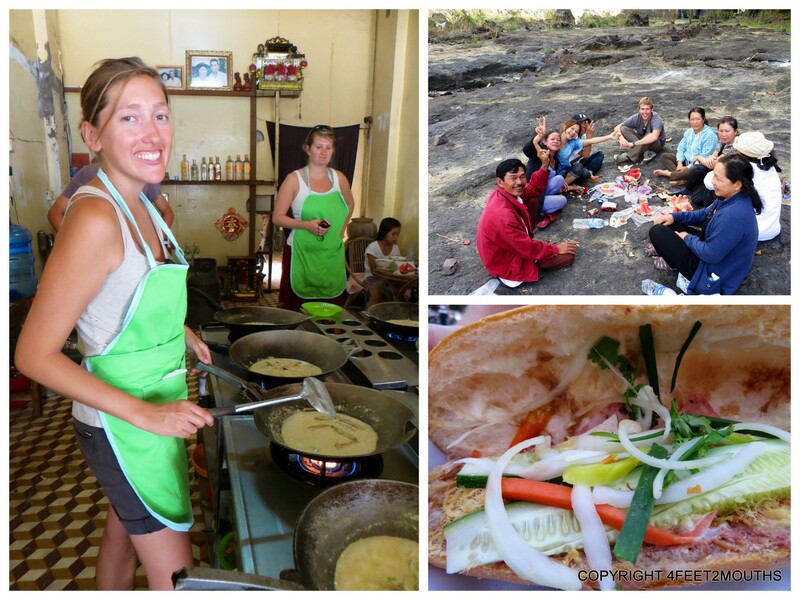 Our hiking began when the tuk tuk stopped at a tiny hut alongside a dirt road. We wobbled onto a tiny canoe to the other side of the river, our trail head. 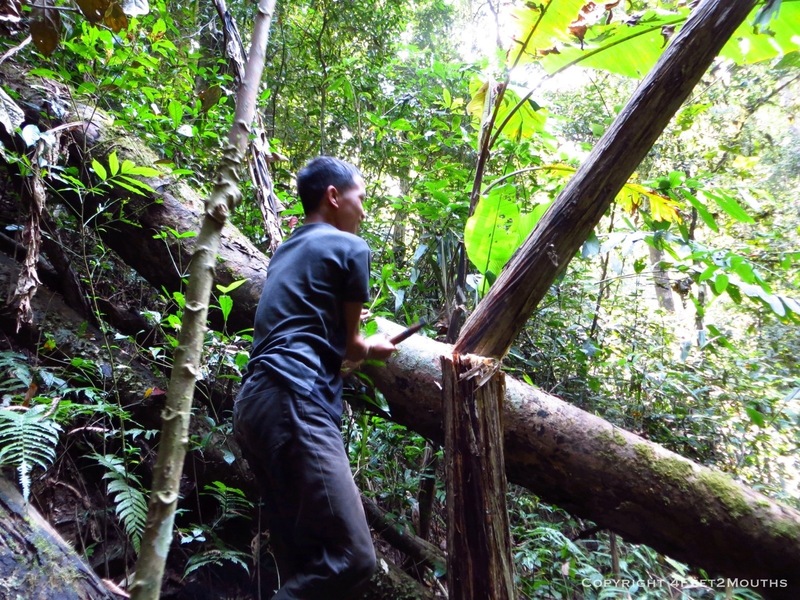 Our guide, Singh, was immediately resourceful in hacking away at the bamboo to create us all walking poles. We stopped to dig up some fresh galangal and to look at the funny local potato. There was almost no visible sunlight as the banana trees and bamboo forests were extremely thick filtering everything in bright greens. The hike was steep and damp. We clambered up the slippery hillside along tiny foot holes dug into the trail. It was wonderful to be walking again, Carmen quickly fell into Camino-like meditations and I enjoyed powering up the hillside. The pace was slow and steady with many breaks. We would stop to discuss local plant life, or try on banana leaf hats, sip fresh bamboo water or test our skills on a crafted bamboo flute. 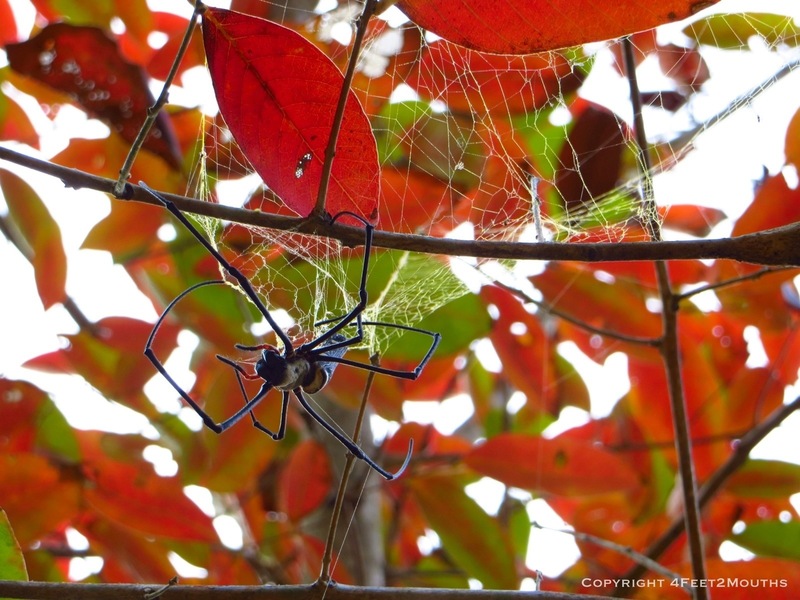 The trail leveled and we pulled off our packs at a rattan hut in the forest. 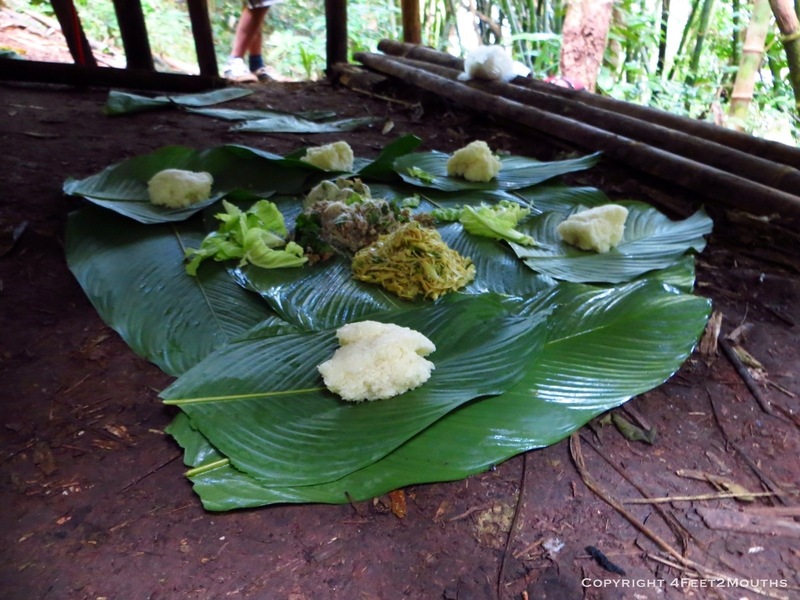 With some banana leaves as our table we consumed our first lunch in the jungle. 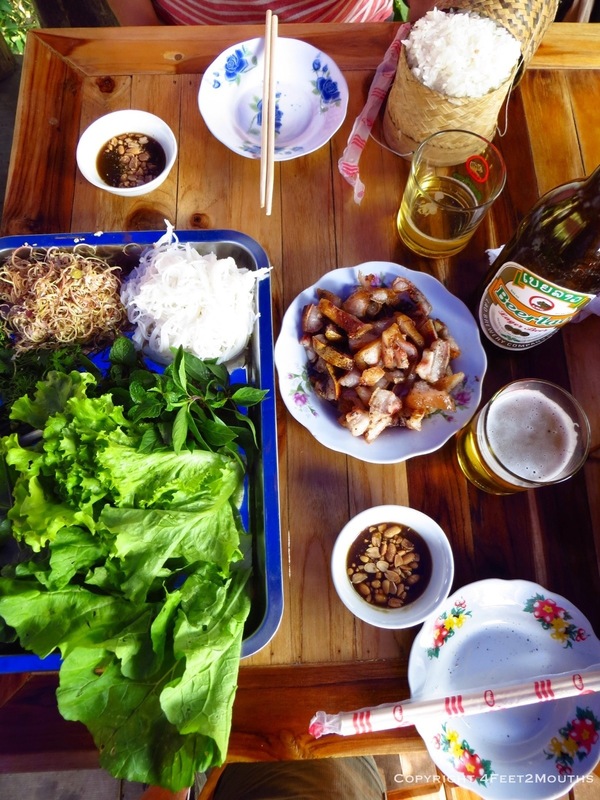 The food was bought from the market that morning and consisted of a cold pork laab salad with mint and chilies There was mashed rattan and banana flower salad and a heaping mound of the Laos staple, sticky rice. 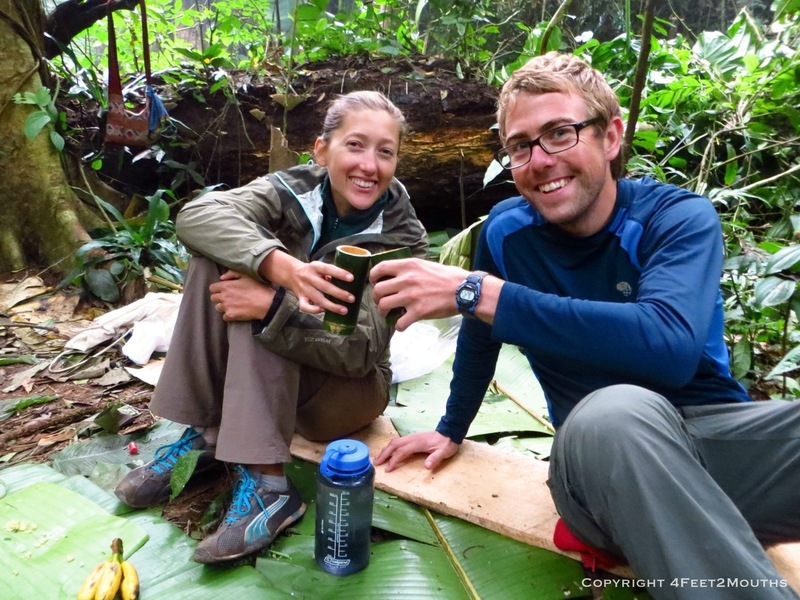 Re-fueled, we continued through the thicket back to the river Nam Thong. 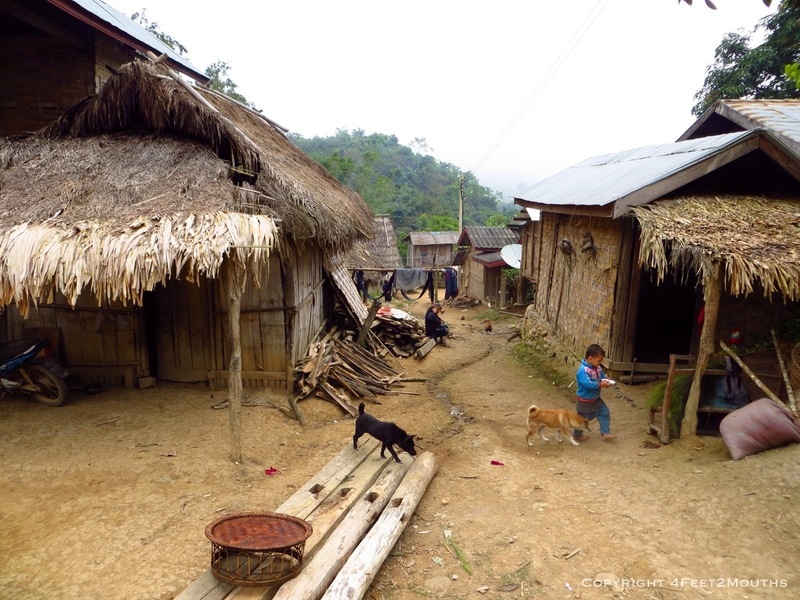 Our first night in the jungle was a home stay with the Khmmu people in Sopsine. There was a dirt road connecting the village from a few years ago, but only a few traveled to town each day. The people mostly survive on subsistence foraging and farming. 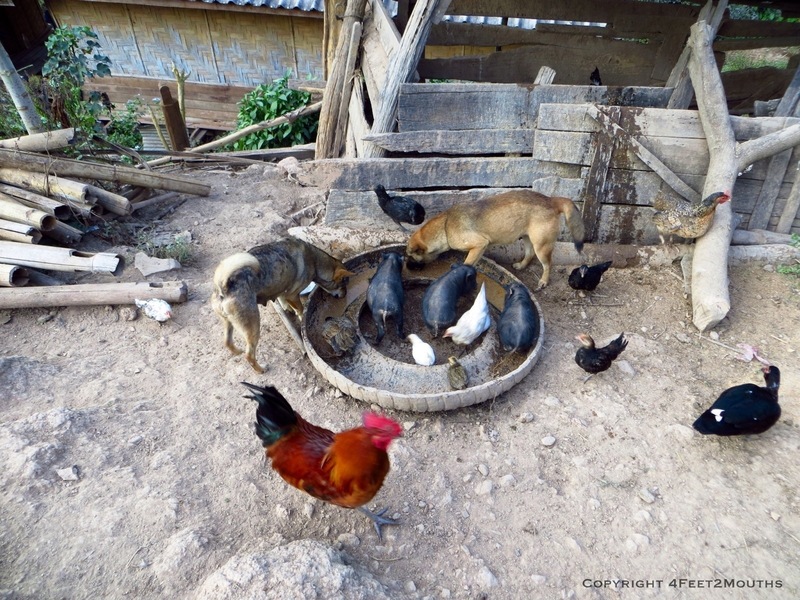 The whole village was active with fifty or so playing children and hundreds of dogs, pigs, chickens and ducks. At feed time, one of the teenage boys pours some grainy slop in a tire and all his animals attack it with ferocity. It was fun watching piglets of just a few pounds try to fill themselves along roosters and comparably sized puppies. The buildings were fascinating to me of course. Everyone built their one-story, one bedroom homes on stilts. The kitchens were outside and elevated as well. There was one water faucet in town that was active with hundreds of people that evening. Everyone bathed (fully clothed) at the faucet or the river, and the townspeople were just as intrigued to watch and observe us at we were at them. It was a sad decision for Carmen and I to get rid of our hiking boots after the Camino when we knew that we would be doing more trekking. 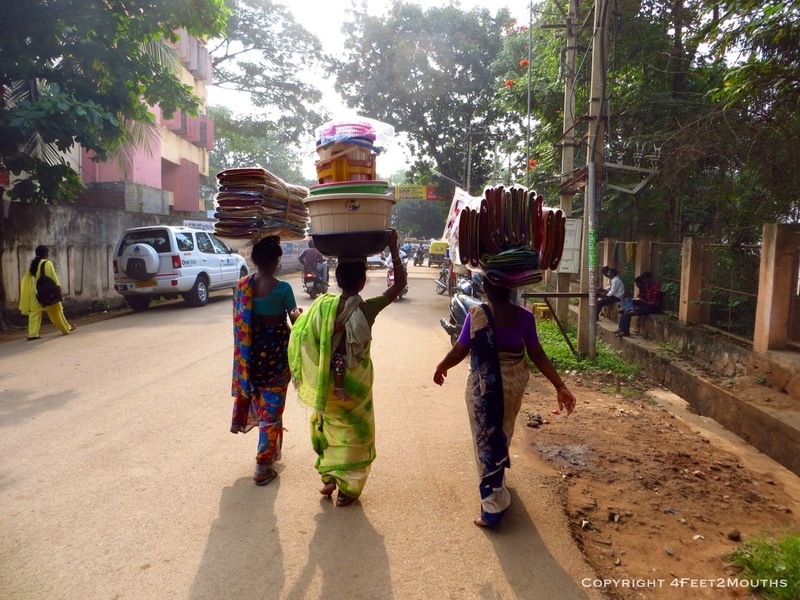 But it was more important to save weight on our backs than protect our feet. Carmen was cursing that decision after our first day of trekking. The path was slippery and all of us tripped at some point of the hike. Carmen took the trophy. She typically is more careful and precise in her walking than me, so when she falls the yell and crash is heard throughout the forest. I turned back to see Carmen arms spread out from her sides, mud caked onto her hips and elbows and her right leg twisted behind her. We get her up, we rub some tiger balm onto her sprained ankle and knee and we hobbled down the hillside. In the village that night we were impressed to learn the genuine concern and sympathy that the local women had for Carmen. One insisted that she create a local medicine to apply to Carmen’s ankle; looking at the ingredients of ginger and salt, Carmen decides to proceed. The woman’s face is thick-skinned and weathered, the room is dimly lit by candles, she bends over to more closely examine Carmen’s foot. She looks at it with deep intensity, so close her nose is almost touching the skin, then “wchieu!” The woman begins spitting all over Carmen’s foot. Apparently the proper procedure to make the paste was in the mouth. The she rubs the foot vigorously with her hands and begins blowing on it. Carmen puts her sock on and we look at each other a little confused and desperately trying to restrain ourselves from the unpredictable laughter. That night we also had a healing elixir that we could all enjoy. 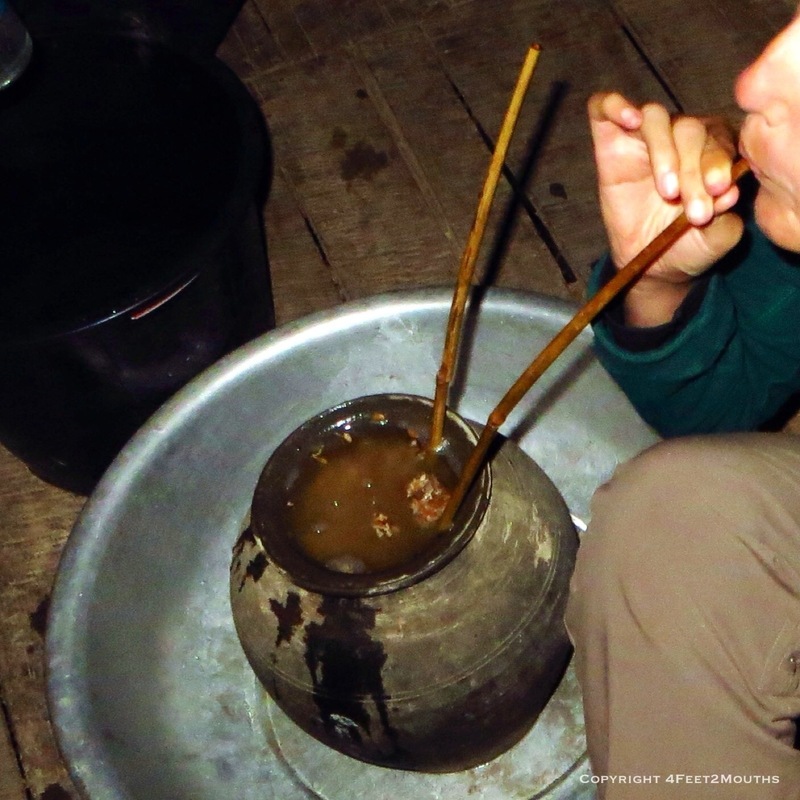 Our guide Singh learned my interest to try any local concoction of fermented liquor and was excited to share a real Lao specialty. Lao hai is made from rice and husks sealed with yeast and water in a clay jar. 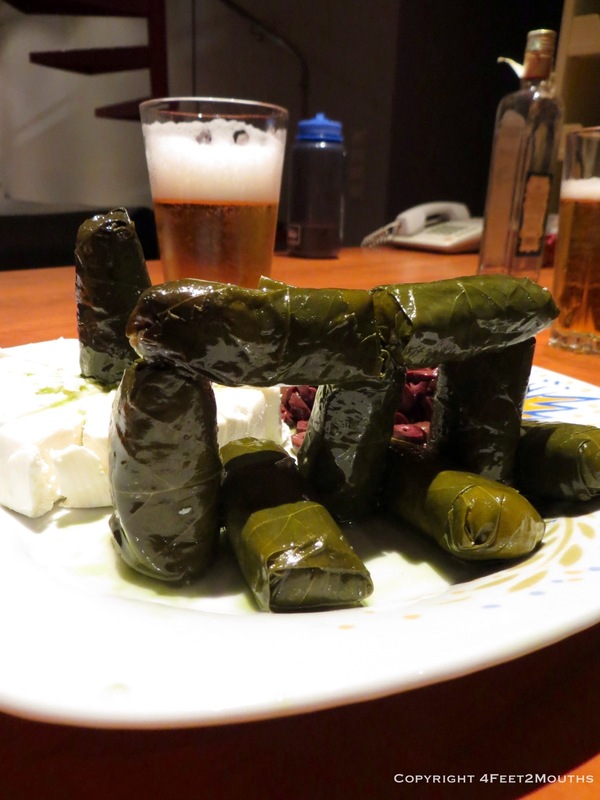 It ferments for several weeks, the the two foot clay pot is muscled to some party location. 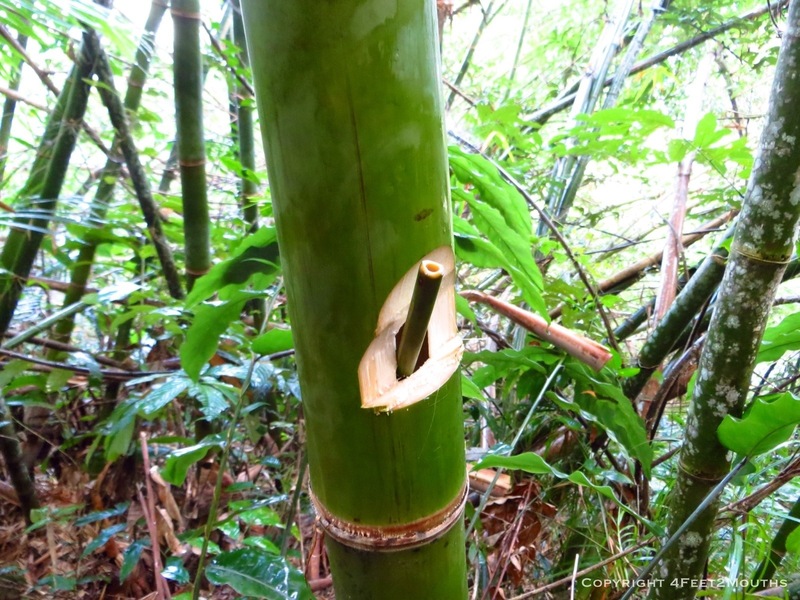 The earth seal is broken and long bamboo straws are inserted into the fermented mash. They then add many cup filled of water which causes the swollen rice kernels to replace the alcohol with water. After a few minutes the bottom of the jar is filled with a delicious alcoholic juice. The taste was extremely sour, sweet with a touch of fermented funk; most specifically like a starburst candy rubbed around in the sediment of an unfiltered beer. After each series of gulps, the liquid would be replaced with additional water until the liquid at the bottom no longer tasted alcoholic. Unfortunately just sipping was not allowed, at first I was encouraged to drink one cup full, then two, then three, then…we acquired another lao hai clay pot…then four more cups of liquor. Then I stopped. It was just a little shy of the apex, but I did good; unfortunately the girl with a sensitive stomach did not fair so well that night and our guide was hungover the next day. Me, well I woke up fresh as a daisy to nearly fifty roosters causing a commotion over tussling a few chicken feathers, if you know what I mean? 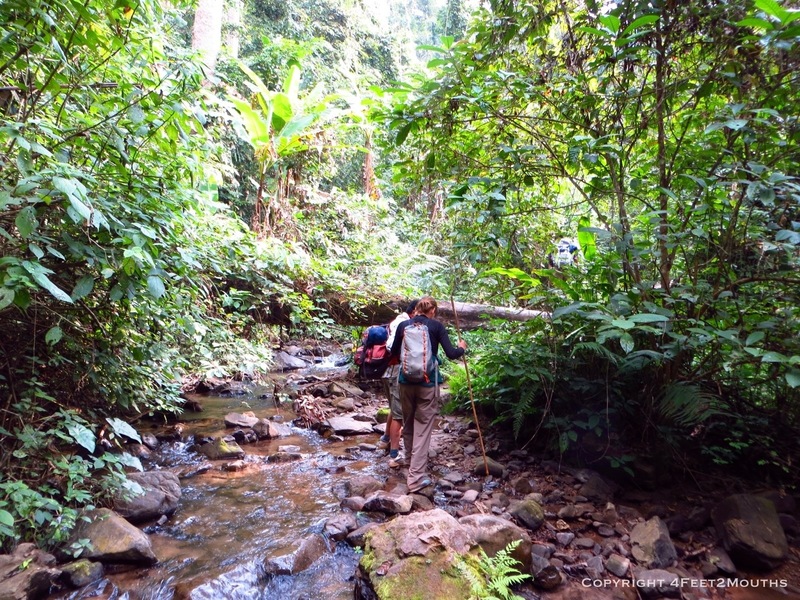 Our second day of hiking would be about 13 miles (20 km) up and down the jungle ridges and following a creek through the forest. The water flow was mild, but we crossed some thirty times on our way to the lunch locations. 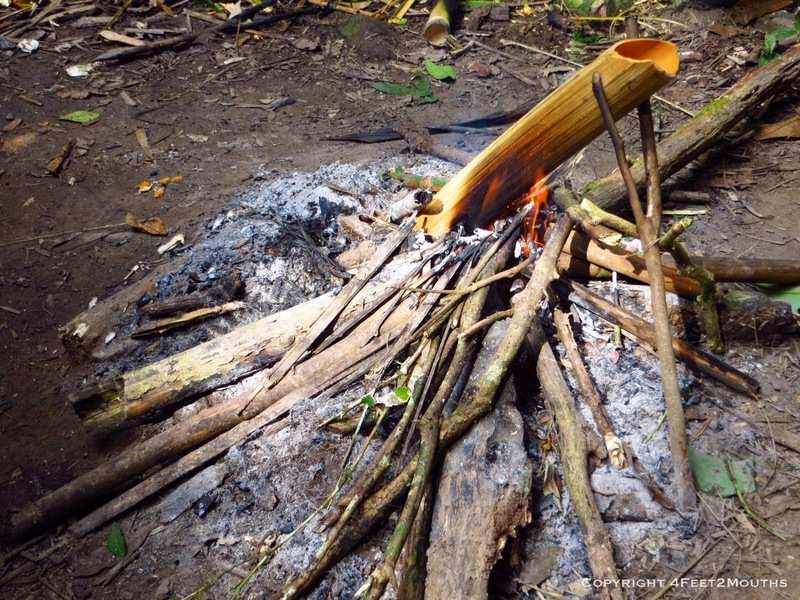 For lunch, or local guides from Sopsine foraged for several stocks of rattan, we stripped them of their spiny bark and separated the crisp pearly heart. The banana flower was also deconstructed and the most tender pedals and filaments were kept and the bitter tougher sections discarded. They chopped a four inch diameter section of bamboo into a two foot vessel. In goes the rattan, banana flower and water; then stuff from the packs: onion, chili peppers, pre-cooked beef. This bubbled and stewed over the fire for 45 minutes when it was drained into a bamboo boat serving dish. 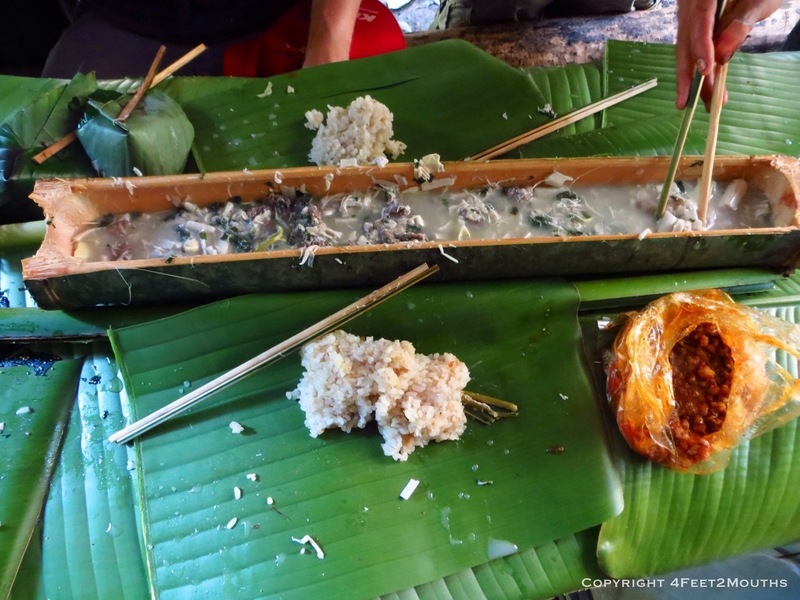 A handful of sticky rice on a banana leaf plate and we feasted. 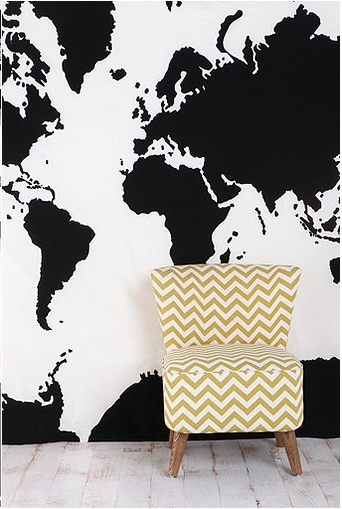 At the time it felt so easy and resourceful to use the jungle in this manner. We were able to feed and use the everything around us. 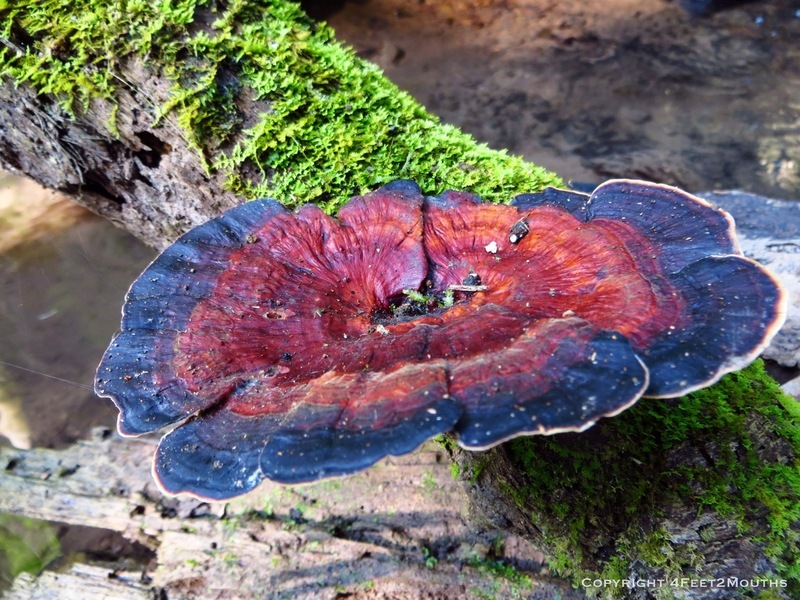 I followed our fourteen-year-old guide into the forest. He was wearing flip flops that I saw him repairing earlier, I had my sneakers. 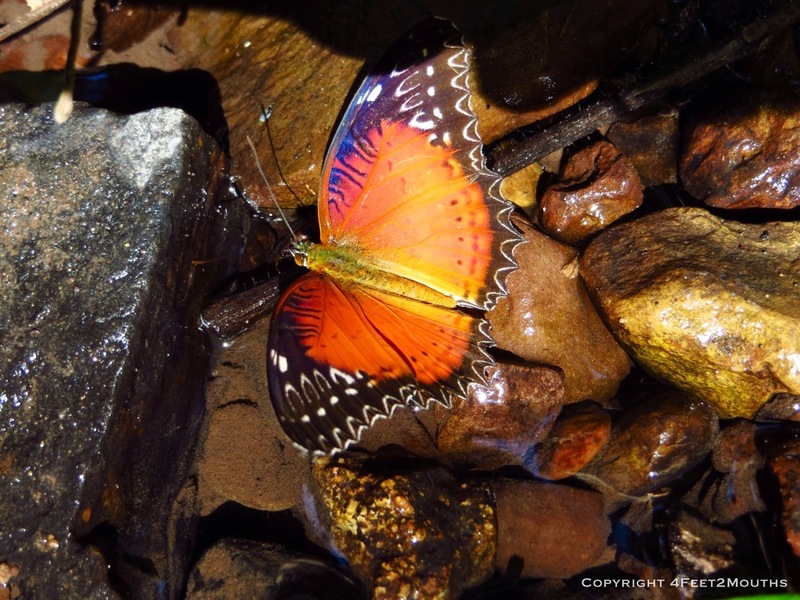 He moved so fluid through the jungle that my loud trampling run could barely keep up. 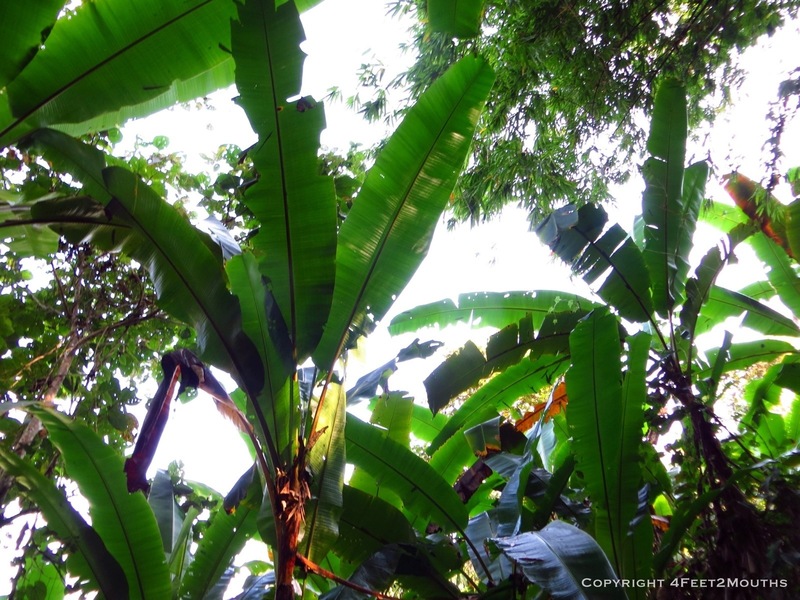 We make it to a grove of banana trees and he points at the leaf above. I think he is going to climb the fifteen foot stalk for a flower or leaf, instead I dive for cover as he slices through the eight inch trunk with four on-target whacks with his machete. He cuts off two of the six-foot leaves and we drag them to serve as a table-cloth. The area of our hike is a national protected area, but it felt like the local people and the tour groups do little to actually protect it. As a tourist, and outsider to the area, regretfully I am also a contributor. Shortly after this I started noticing the heaps of rattan and banana scraps that have been left in the river, the forests of banana trees decimated and the enormous teak trees felled and milled into timber. 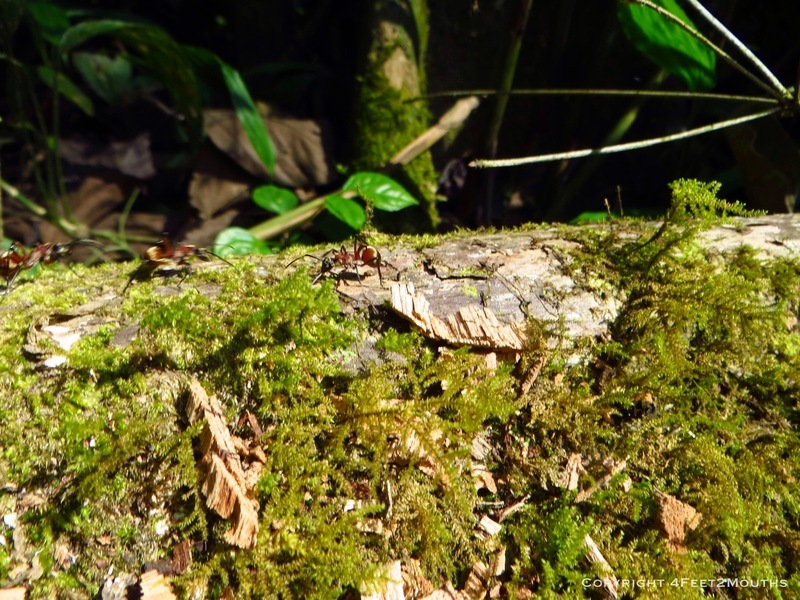 I also noticed the beauty in the small creatures of the forest: a handful of ants, a butterfly and a mushroom. We passed three hunters that were illegally (but hungrily) searching for monkeys and birds on our trail. We did not see any animal wildlife during the three days. Singh, was really empowering as a guide, he literally picked up every piece of plastic he saw during our trek. Nevertheless, he still lit the fire with plastic bags as the starter. I think the people generally care about their environment and jungle, but their people have been surviving here for hundreds of years despite the imaginary protection zone that encroaches near their village. 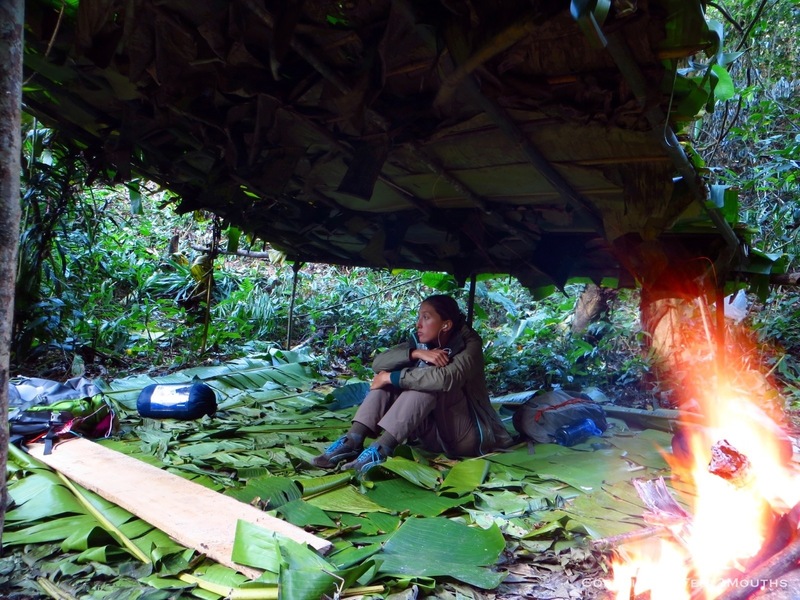 I have mixed feelings- I thoroughly enjoyed learning about surviving on the jungle, but I was uncomfortable seeing the effects of tourists like me to the jungle. 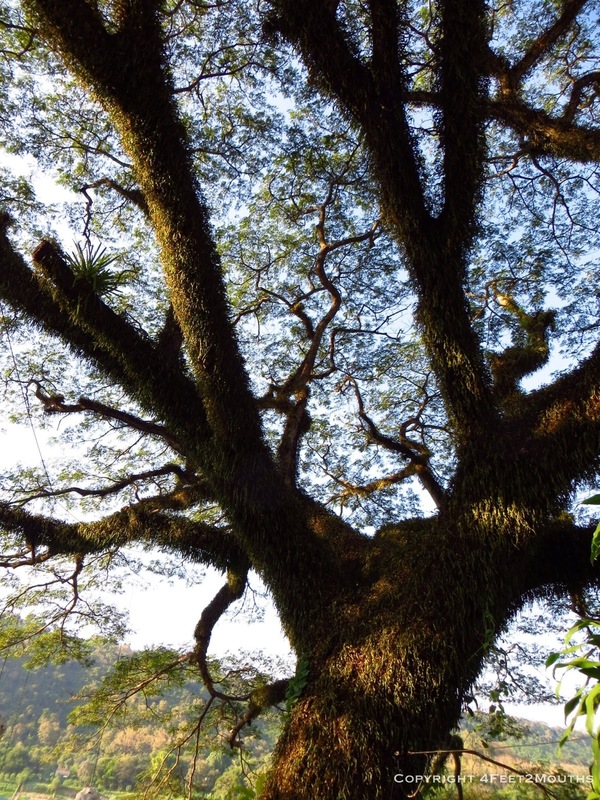 The jungle is bountiful and I am happy that we had a chance to experience it. That night we were roughing it. We laid out our cheap borrowed polyester sleeping bags on banana leaves beneath a tiny bamboo and banana leaf shack. We had a fire that I turned into a bonfire and I was later scolded for using up all the wood (that I gathered). We cooked again over the fire, but the night was short. We were all tired, a little cold and eager for the deep sleep that accompanies a long day of hiking. The next morning we woke early with hot chocolate from bamboo mugs and fried rice our of banana leaf bowls. 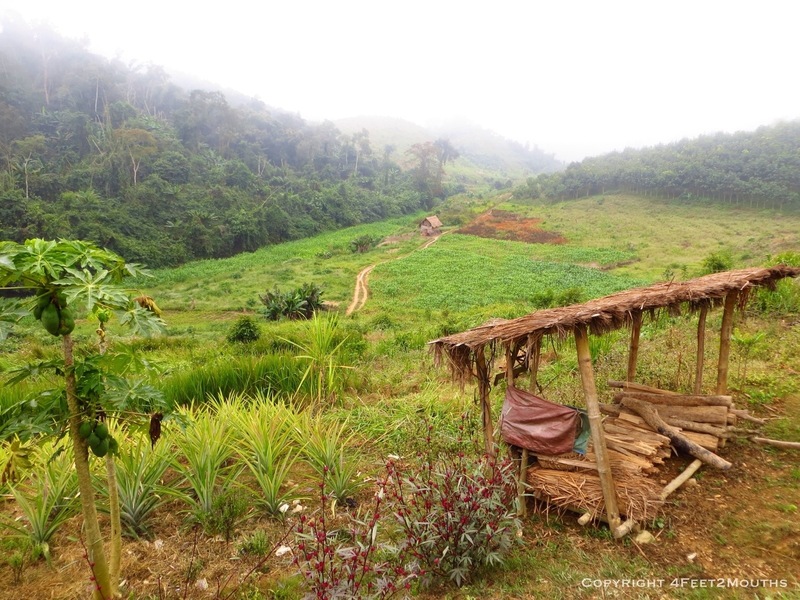 About a half hour walk into the jungle and the trees disappeared to make way for the Lentan village of Nam Khone. 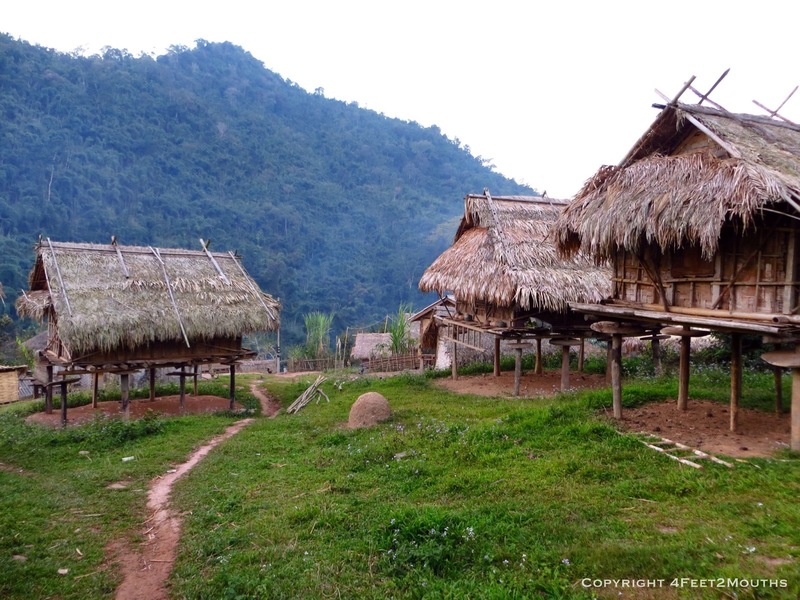 Many of the people of these communities have heritage from from Tibet and southern China as they were once refugees that settled in Laos two hundred years ago during Chinese civil war. The houses were mostly built on stilts with tangled alleyways confused with roaming farm animals and children. We hung out at the new school that the E.U. had built as well as watching a group of women unwind and prepare to weave a traditional fabric. 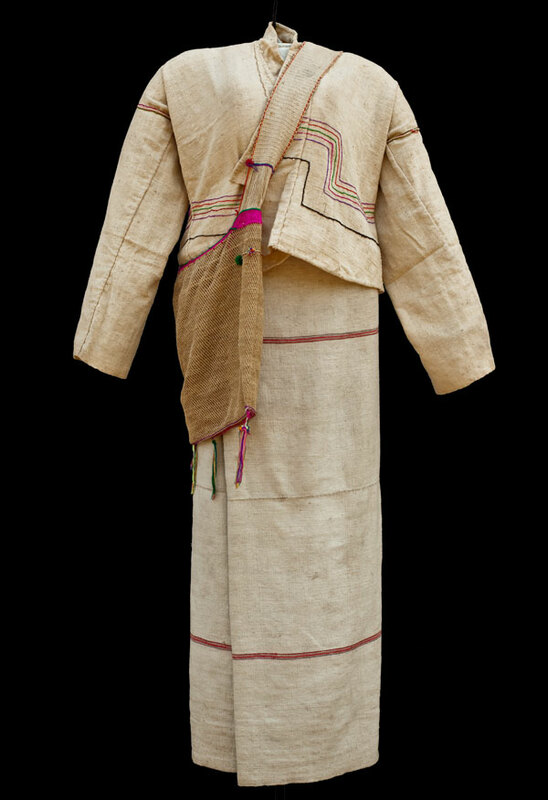 The women tie their hair in a tall bun above their head that is decorated with silver coins, a thick indigo fabric is wrapped around their body and white wool angle-warmers finish the traditional outfit. 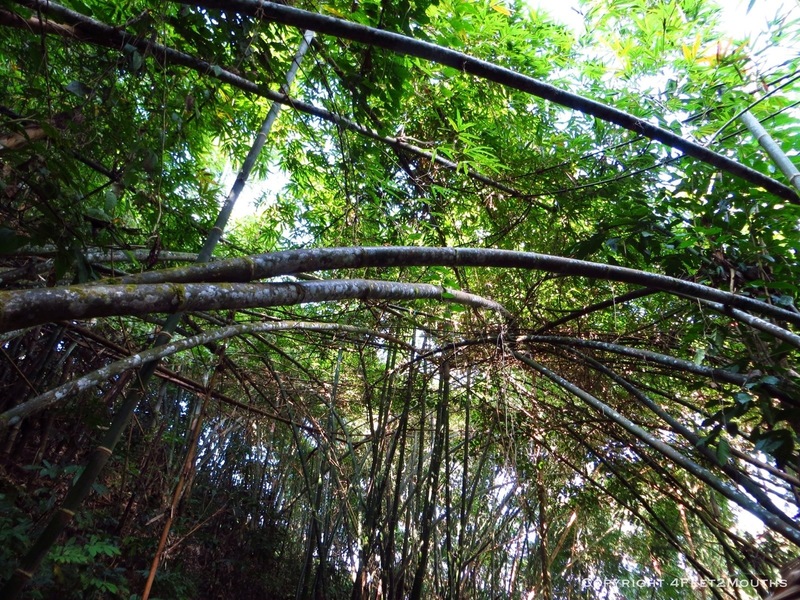 We crossed through the village to rejoin the trail that climbed into the bamboo forest. We hiked for several more hours that day. We cooked again using rattan, banana flowers and bamboo. It was so nice to be hiking again, up and down the mountains and through the forest is always an exhilarating experience that I enjoy. The end of our trek was met with a quick swim in the River Nam Thong and walk through the roadside village of Bom Pieam. 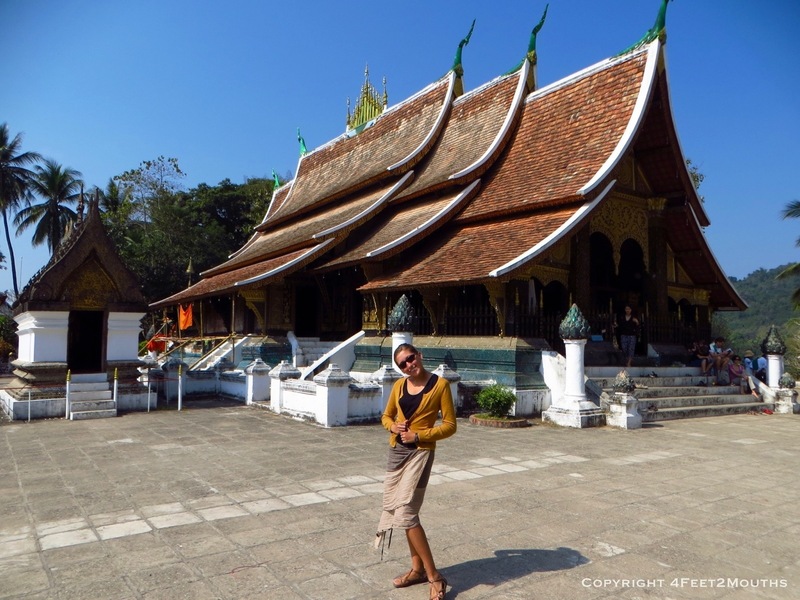 We loaded into the tuk tuk and bounced our way to Luang Namtha. The jungle was a wonderful opportunity. We were able to gain insight about the people and their environment as well as forage for some of our own food. The impacts of our presence was not fully positive, but I value the experience enough that I would probably do it again. That night we again slept like babies, exhausted from our trek. 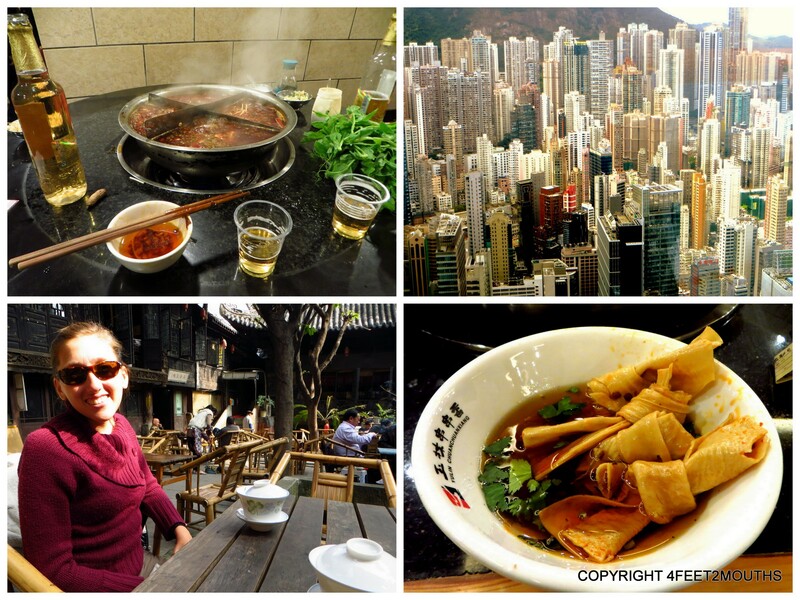 Our morning was rushed, we packed, checked-out and scurried around town in search of breakfast. We settled on someone’s front yard turned into a restaurant. 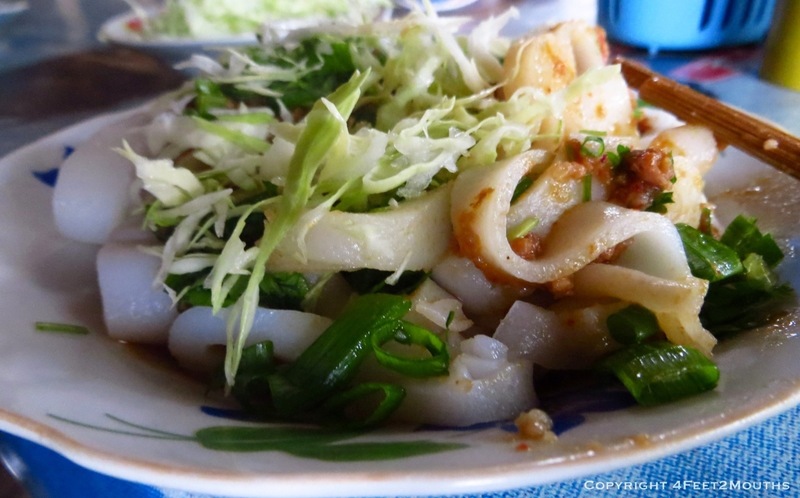 We were given steaming bowls of rice noodles with some mysterious red sauce. I do not know if this was intended, but the end product was a delicious pasta bolognaise. Spicy and thick with tomatoes and herbs, we shoved in chop stick full after chop stick full. 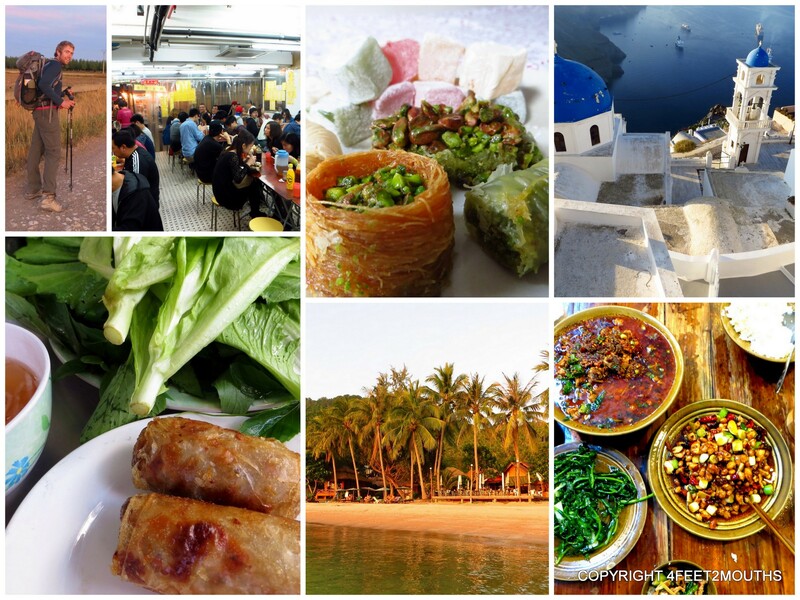 What luck for us to find a delicious local dish that could please our nostalgic appetites. I’m pedaling furiously, with a scooter in front and a scooter behind me. 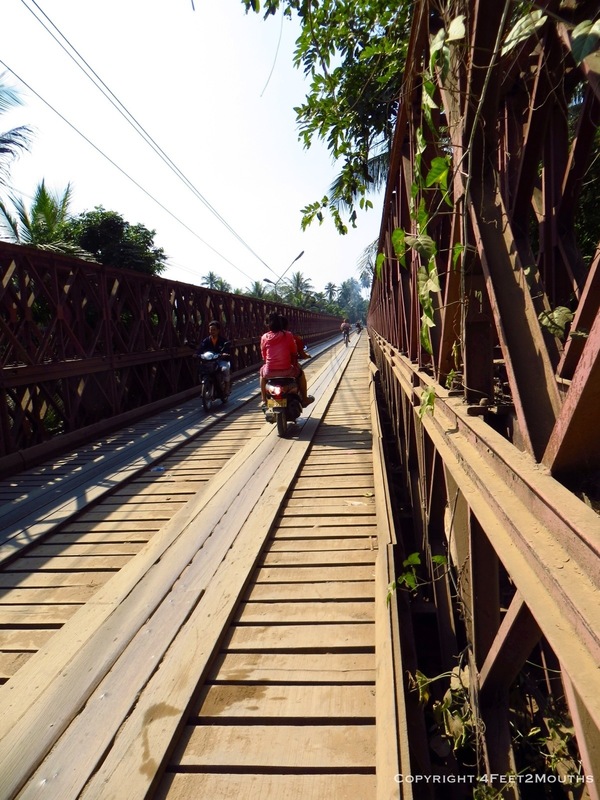 I’m on a simple wood and iron bridge with two sets of narrow planks for scooters and bicycles to use single file. The river below peeks out through gaps in the decking. As I ride, brow furrowed in concentration, it hits me. I’m in Laos, cycling across a wooden bridge with scooters and this feels somehow normal. I have now been traveling so long that the unfamiliar has become standard. The thought brought a smile to my face. Crossing the bridge occurred on our last day in Luang Prabang but from the beginning the town offered a mix of the familiar and unfamiliar. For example, I woke up our first morning craving some comfort. We had survived a 27 hour bus journey and I wanted a reward! 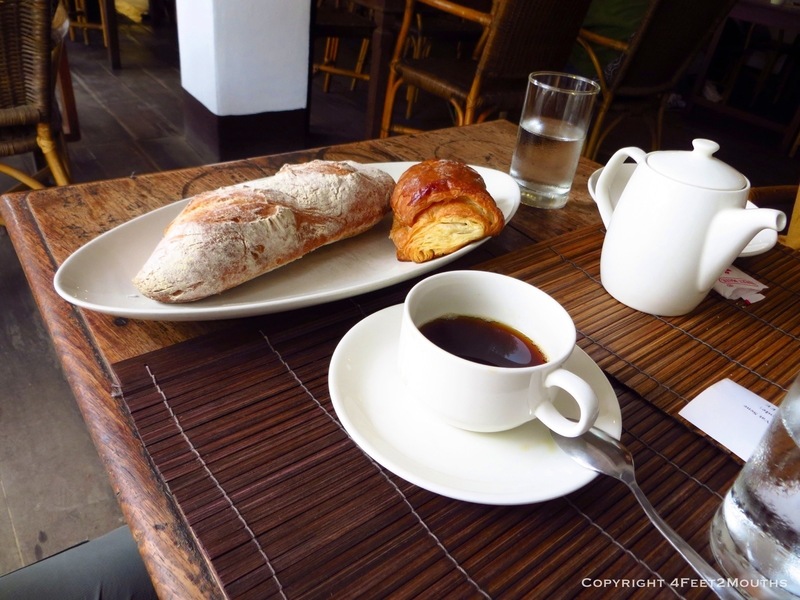 So we headed over to Le Cafe Ban Vat Sene for some coffee and pastries. I bit into the warm-from-the-oven pain au chocolat and realized how very long it’s been since I’ve had such a buttery, rich delicacy. 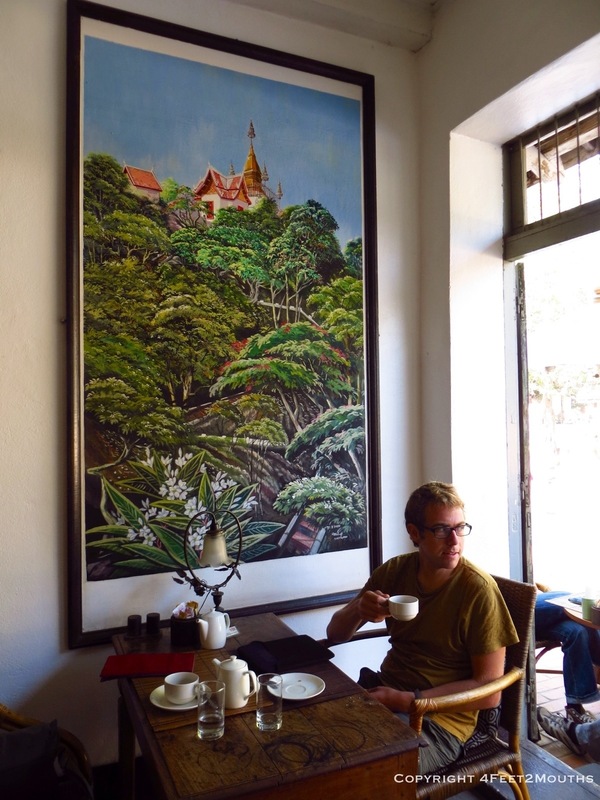 Taking our time at the cafe was a wonderfully slow introduction to Luang Prabang. Nearby the cafe was Wat Xieng Thong. 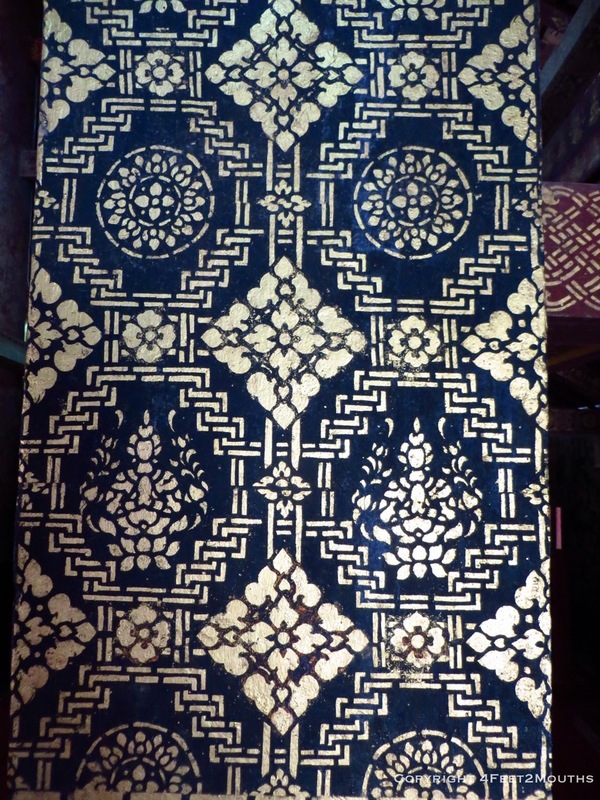 The beautiful stencil work at the wat inspired Nathan and I with decor ideas for our future home. I also loved the pretty mosaics that adorned the outer walls. In the main shrine, they had the life size figure of a wise looking monk in a meditation pose. These statues are sometimes metal and sometimes wax. The wax ones always make me look twice, thinking its an actual person. Within the wat complex we saw many monks working on the grounds. 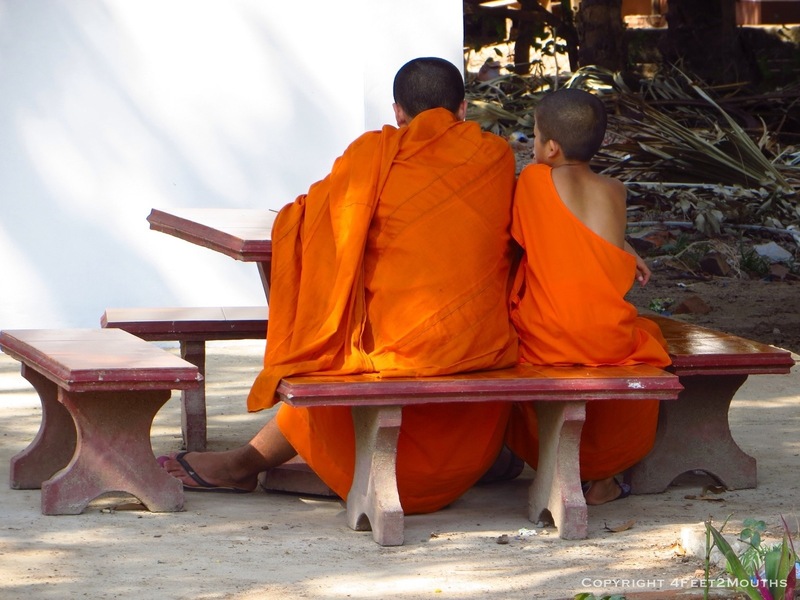 Monks in Southeast Asia are not necessarily ordained for life. Instead, some are only participating for a few months or years to bring honor to themselves and their families. That’s partially why a significant portion of the monks are young boys. 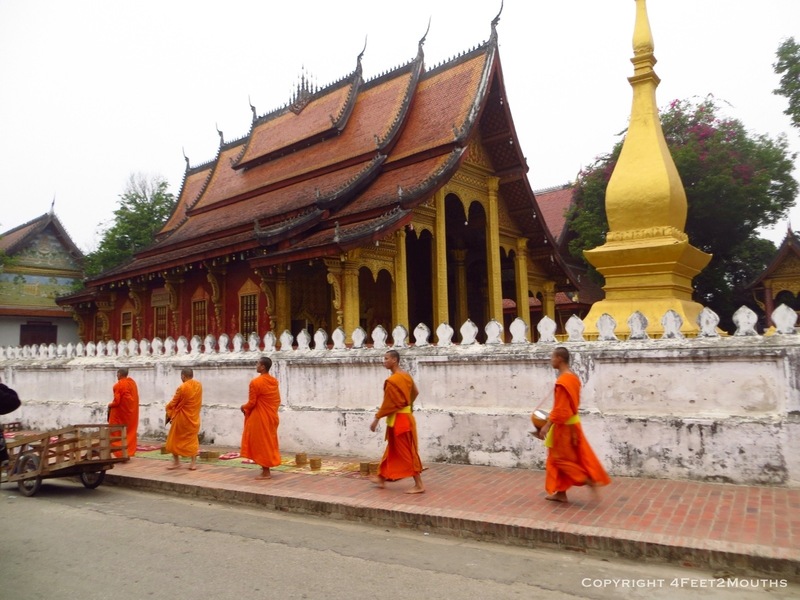 Luang Prabang is a center of spirituality for Laos and therefore has a greater monk population. 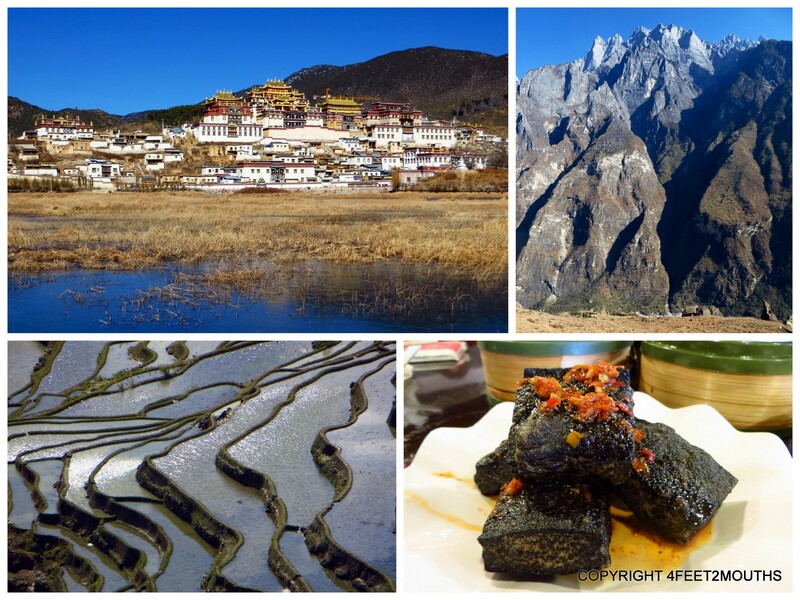 This is part of its mystique and also part of the tourist draw. 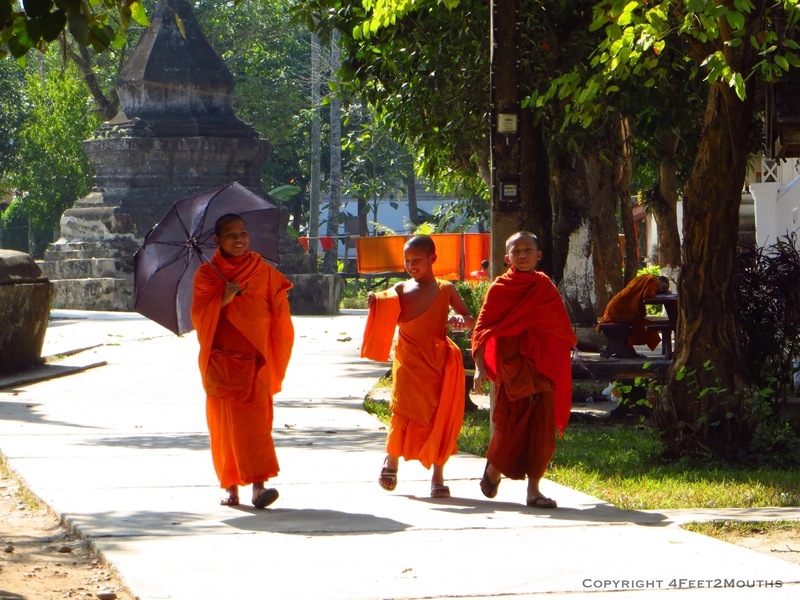 One morning we awoke before sunrise to watch the morning alms procession. 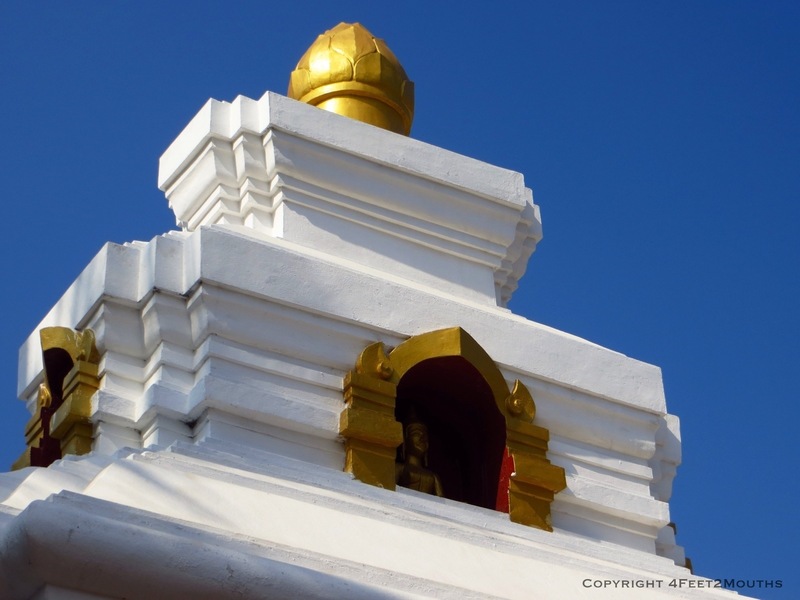 It is supposed to be a fulfilling experience to see people giving freely to the monks so that they may eat that day. However, it has become something of a tourist circus with big cameras being stuck in monks’ faces. But the monks handle it with grace and, hey, everyone has got to eat. Speaking of eating, we made our way to a street stall for lunch after our wat visits. 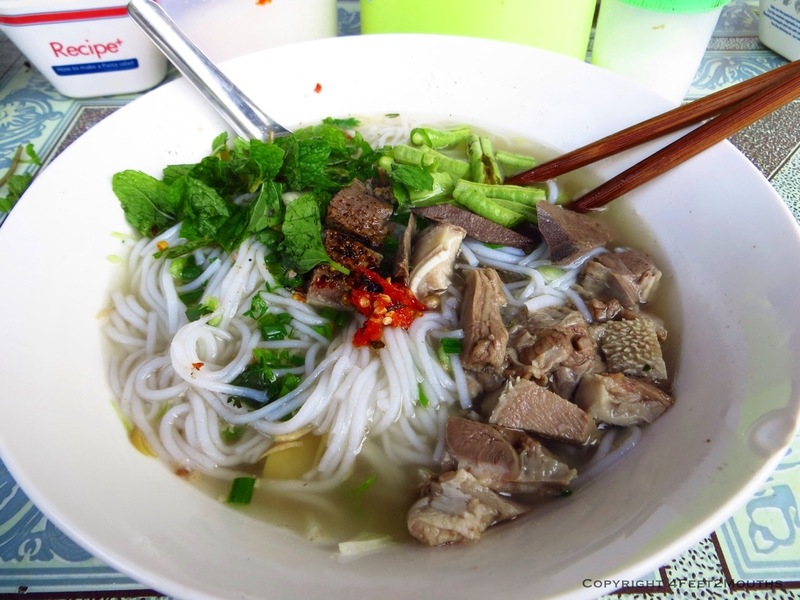 It was a simple noodle soup; not as complex as some the ones we were enjoying in Vietnam. But it was still full of comforting vegetables and a toothless cook bidding us “merci beaucoup” as we waved goodbye. Later in the day, we were able to meet up with Julia and Jonathan again! 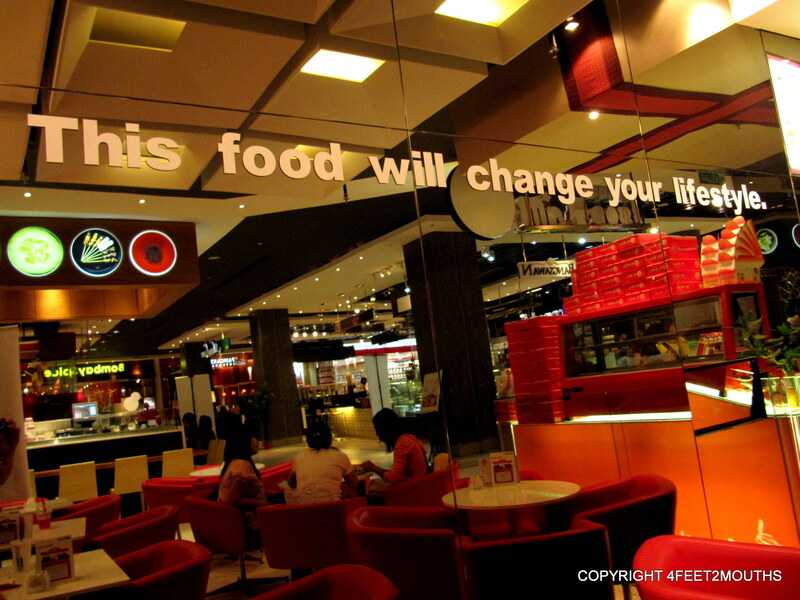 Like us, they are fans of trying new, unfamiliar foods. Unfortunately, one of their meals did not quite agree with them. 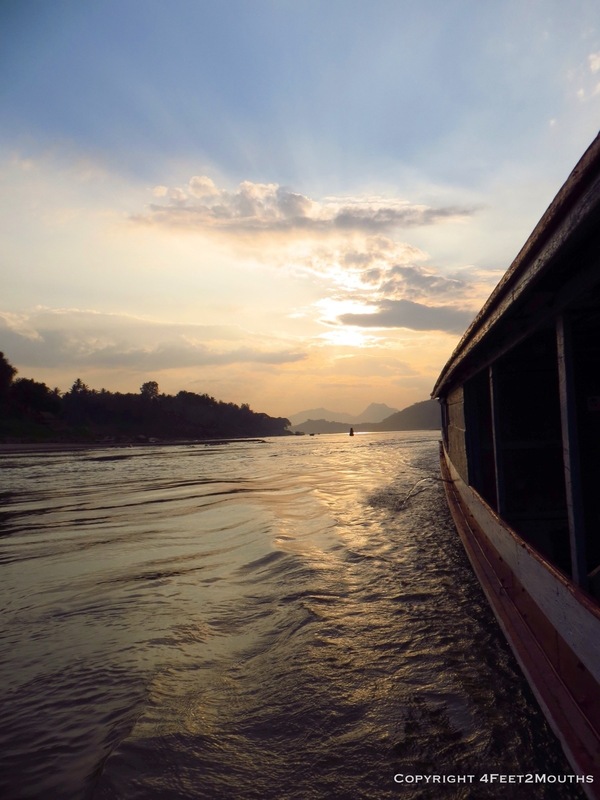 Therefore we took a nice and easy sunset cruise along the Mekong River. 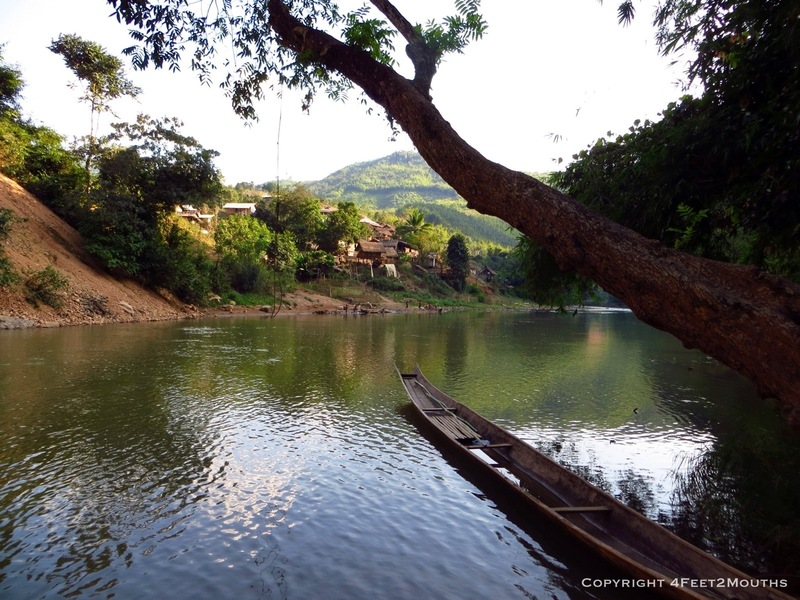 The Mekong is not the only popular water body in Luang Prabang. 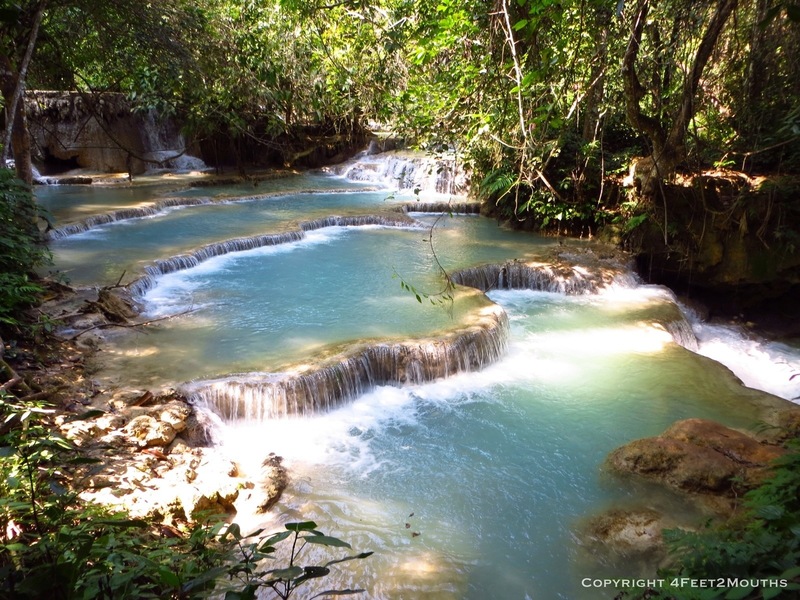 We also visited the Kuang Si Waterfall. 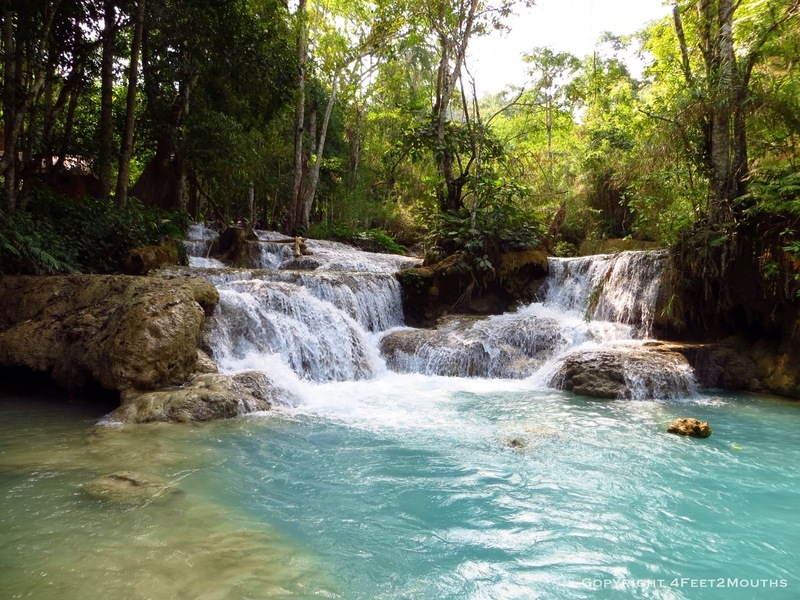 I had expected a pretty little waterfall but I was surprised to find such beautiful, bright turquoise waters. We used a side trail to reach the waterfall so it felt like our own little discovery…at least until another group of tourists showed up to our photo op space to take their pictures. The weather was absolutely perfect. Not hot, not cold, not humid, not dry. It was such a pleasant walk as we made our way downstream. Before long we found the swimming section and within seconds Nathan was jumping into the cold water. Julia and Jonathan joined in but I was content just sticking my feet in. We could have enjoyed the swimming hole a bit longer but there was another waterfall on our itinerary. 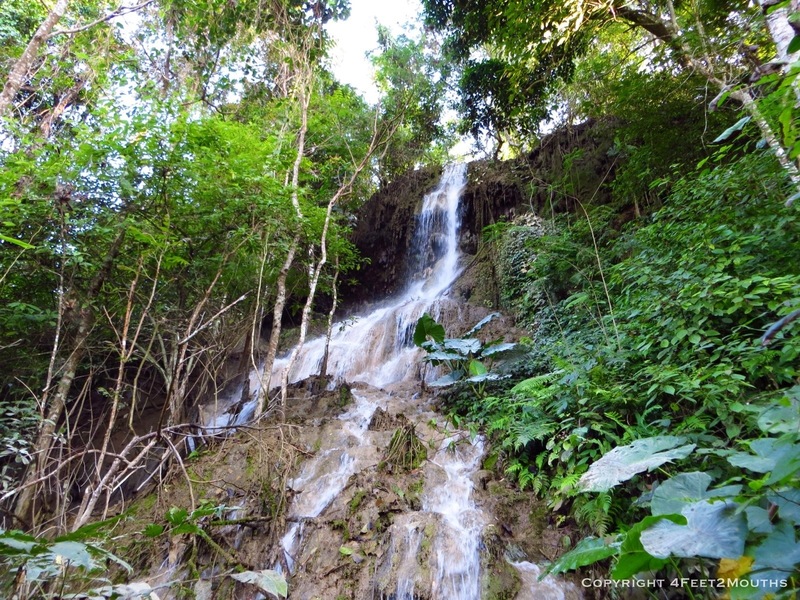 Tad Sae Waterfall is accessed via an easy, stone path winding its way through the jungle. Or so I was told. 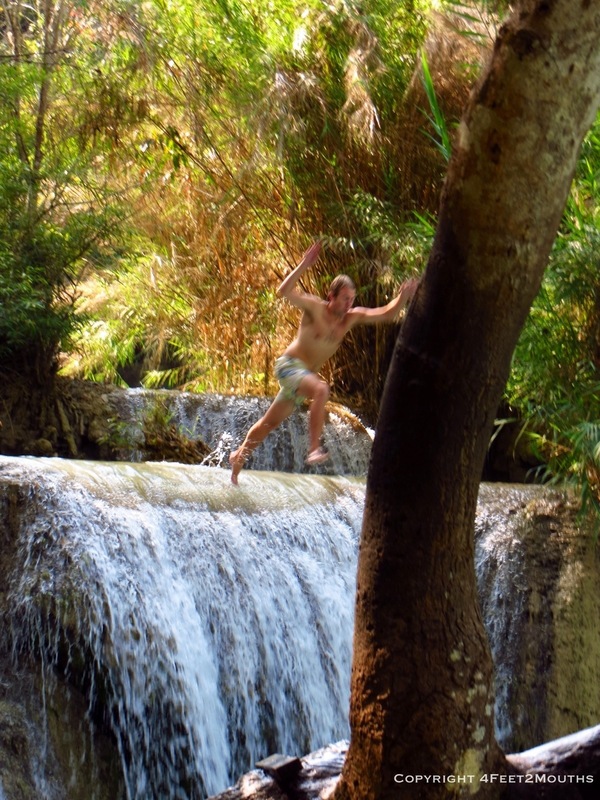 I had stubbed my toe at the Kuang Si Waterfall and did not feel up to visiting the second one. 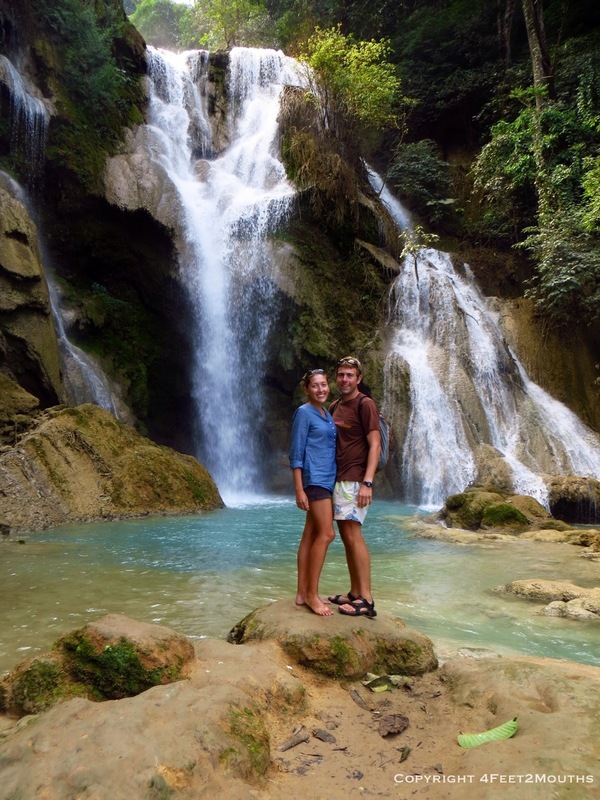 While I recovered, Nathan, Julia and Jonathan enjoyed the natural beauty of Tad Sae. Before we knew it, our final dinner with Julia and Jonathan was upon us. 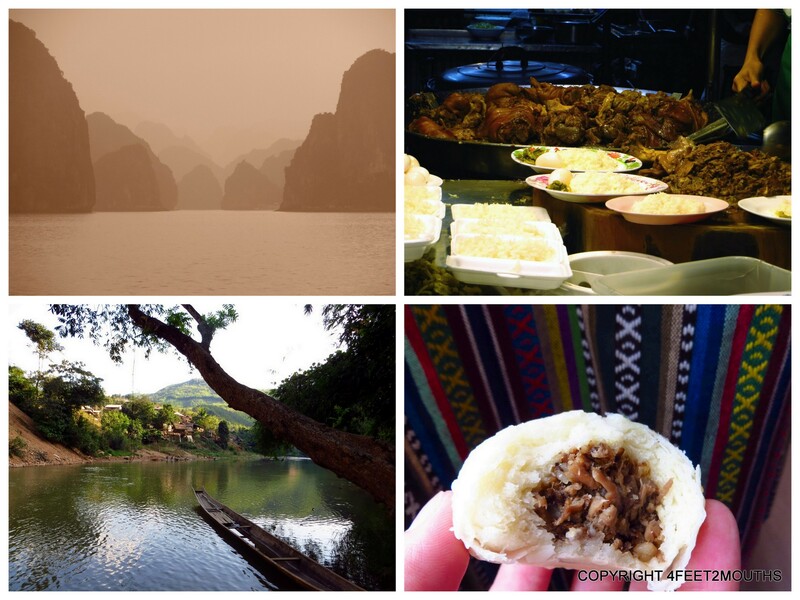 It had been awesome to visit Hoi An, Hanoi, Halong Bay and Luang Prabang with them! Together we toasted all the good times over Korean food at Big Tree Cafe. Which brings me back to the wooden bridge I mentioned earlier. Nathan and I decided to rent bikes and ride to the bus station for tickets. This took us out of the normal tourist zone pretty quickly. On our way back we noticed a smoking hot BBQ and decided to stop for lunch. We ordered what we thought was a pork chop on the grill, which turned out to be a slab of pork fat. Whoops! Not bad with some beer and tamarind hot sauce. 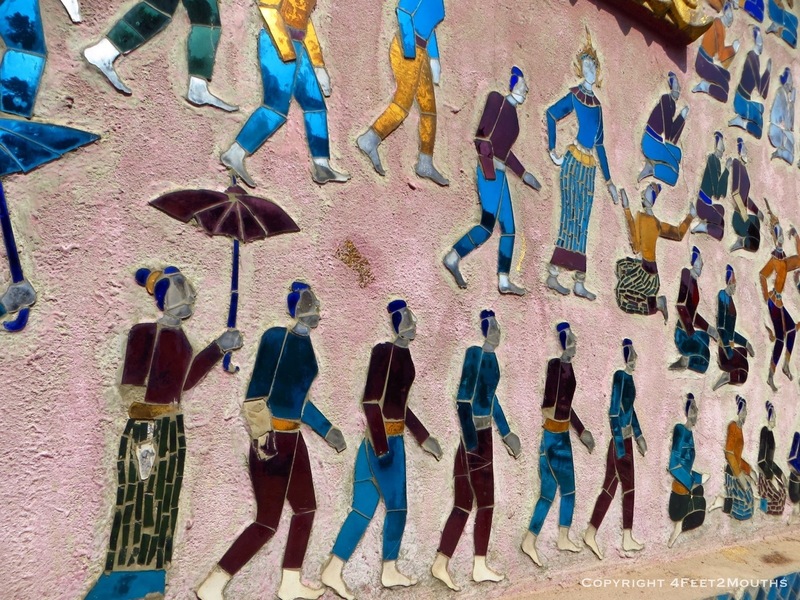 One of our last sights of Luang Prabang was the excellent Traditional Arts and Ethnology Centre which clearly outlined the various ethnic hill tribes of Laos. They each have distinct languages, customs and dress. Fortunately we were going to see some of these tribes first hand since our next stop would be a three day jungle trek to visit mountainous villages. 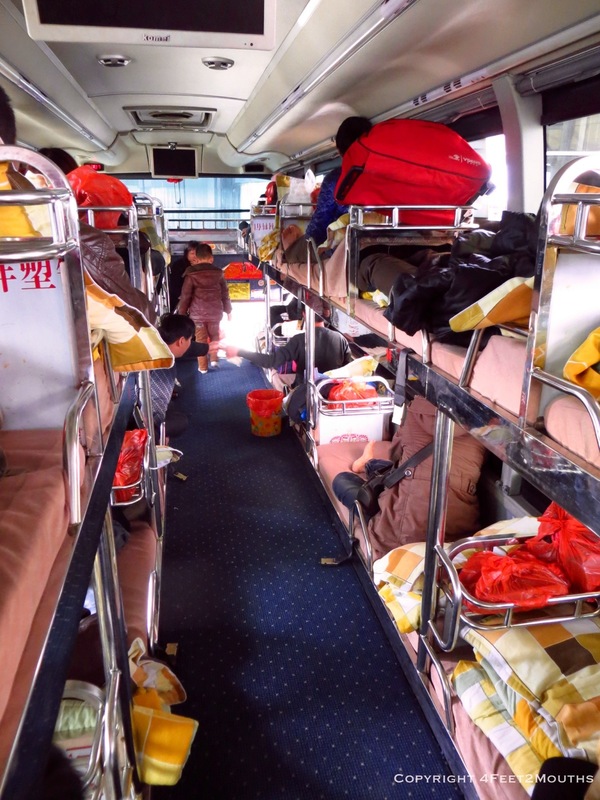 We bid goodbye to the cosy comforts of Luang Prabang and boarded a bus to Luang Namtha.